As Sophia Kelly sips coffee at the small desk off her kitchen, she also drinks in the lovely view of her ravined backyard in Scarborough. She and her husband, Jeffrey Dean Kelly, couldn’t be happier with the way interior designer Cynthia Soda transformed the living space of their 1950s bungalow. 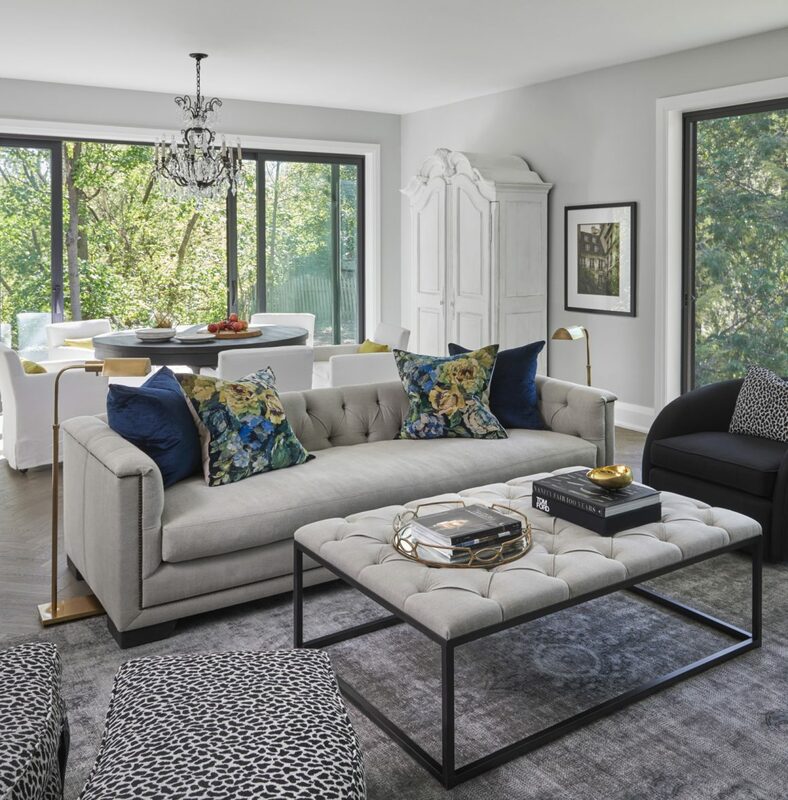 “The additional windows and transom doors have turned what used to be the darkest corner of the house into the brightest space,” Sophia says. “We’ve brought the outdoors into their home to enjoy year-round.” Soda says. The designer, who runs Soda Pop Design, had originally been called to create plans for a kitchen renovation that would include updates to the living and dining area. But she and the homeowners soon discovered that there had been damage caused by the bungalow’s flat roof. “It meant a larger project, but we recommended changing the roofline,” Soda says. The additional expense and inconvenience prompted the couple to search for another home instead, but none compared with their location along a tranquil ravine. “Once we realized how special our property was, we knew it’d be worth the investment to make this our dream home,” Sophia says. Backless bar stools keep the view through the kitchen to the backyard clear, while ceiling beams and an island with furniture footings are warm traditional elements. Windows: Pella. Soda collaborated with her architectural team to redesign the roofline and turn sloped ceilings into an 11-foot consistent height. Working within the home’s existing footprint so no special permit would be required, she also proposed moving the galley kitchen to the back of the house from the front to open all the main living areas and create a grand entry. Marble is a classic element on this dividing wall. A three-sided fireplace, built-in display cabinet and adjoining desk aesthetically break up the main living space in a functional way. 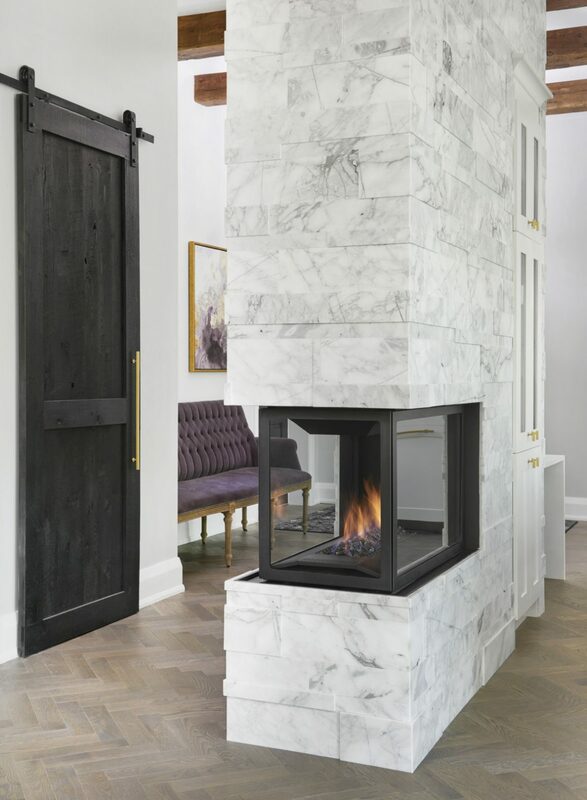 Fireplace surround: ErthCOVERINGS. 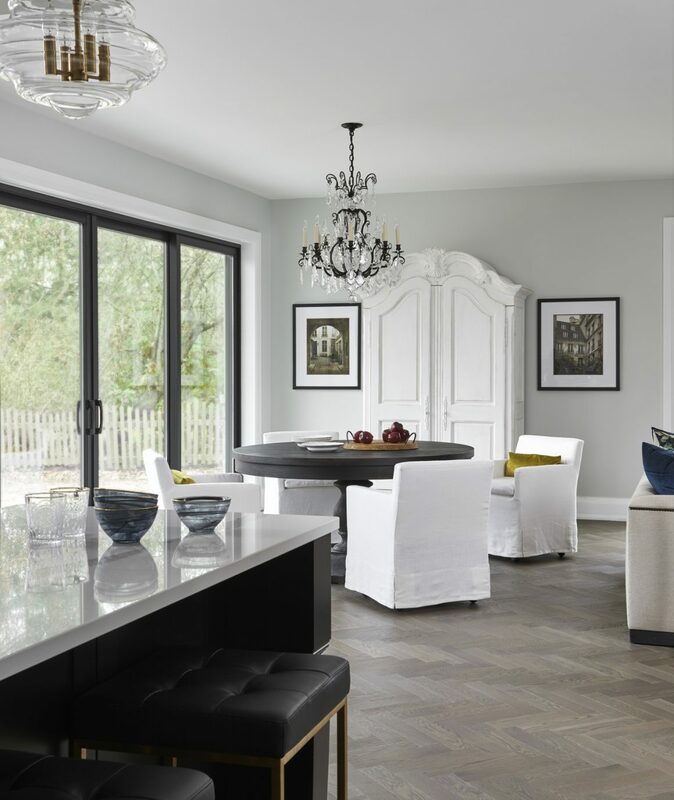 A herringbone-pattern hardwood floor was a splurge but it provided a subtle, fluid dynamic that Sophia adores. “It reminds me of being in Paris,” she says. Among the design elements in the kitchen that marry well are a rustic farm sink, attractive pendant lights, herringbone flooring, a marbled dividing wall, gold-coloured hardware, and detailing on the island’s base. Flooring: White Oak Zeus with a UV oil finish; pendants: Washington chandelier from Elte; ceiling beams: by Anazaõ Inc; countertop: Brittanicca from Cambria. The couple’s existing dining hutch was painted white for a shabby-chic look against the slightly grey walls. 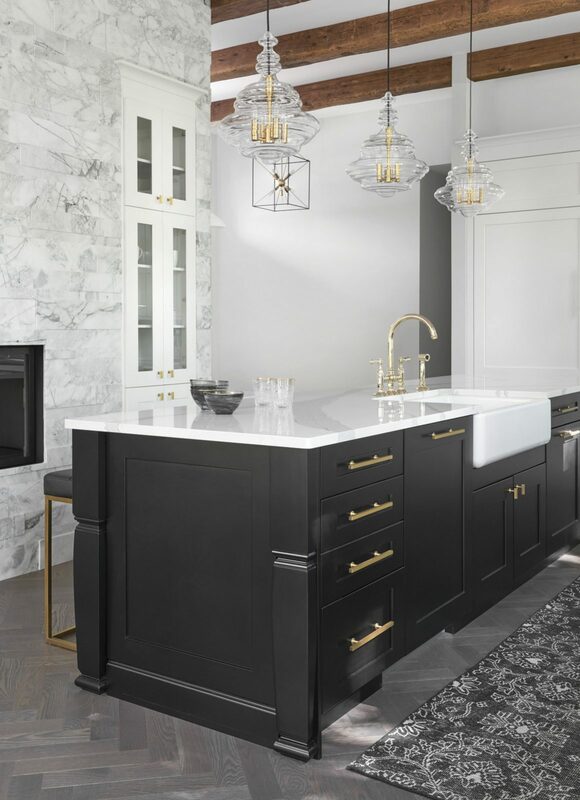 “We had the chandelier’s brassiness painted black to update its look to fit with the white, gold, grey and black scheme we have in the home,” Soda says. 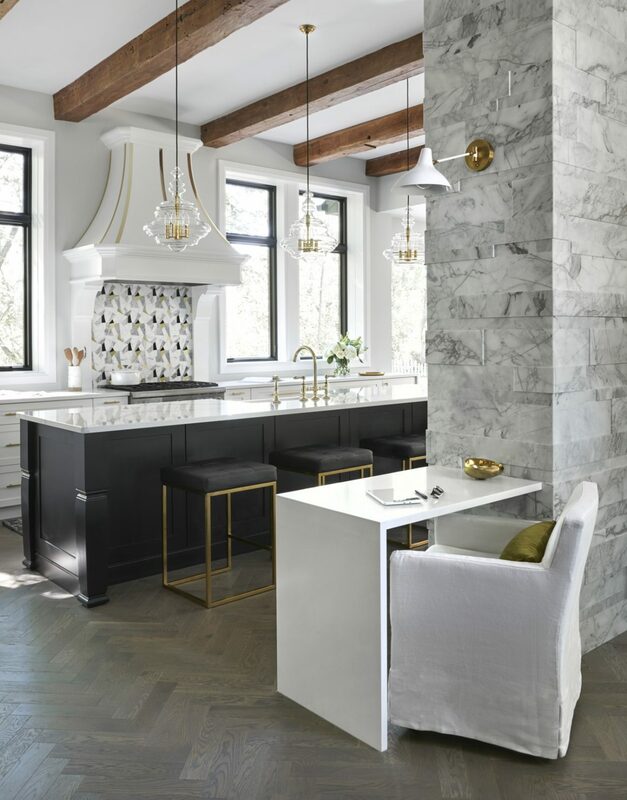 Glass-and-gold pendant lighting over the kitchen island draws the eye upward to the wood beams that give the ceiling its warmth. 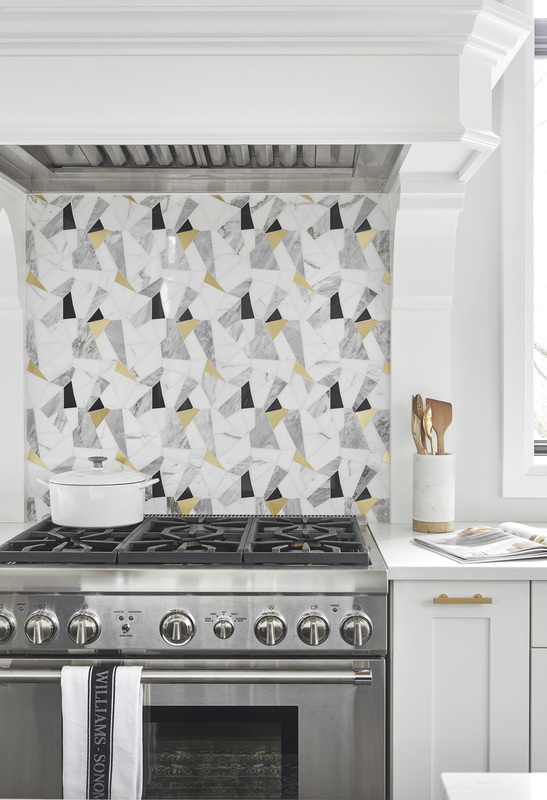 Designer Cynthia Soda wanted the backsplash to be a piece of art; its mosaic tiling makes a strong design statement. Range hood: custom-designed by Soda Pop Design Inc. and built by Colclo Custom Woodworking. Solid bright colours, along with floral and leopard prints, add interest against the neutral canvas. Glass knobs on the doors and night tables add sparkle. The master bedroom echoes the living area’s elements. The handles on the night table, for instance, were replaced with crystal knobs so they would coordinate with the glass doorknobs throughout the home. “It’s those small touches that elevate a look.” Soda says. 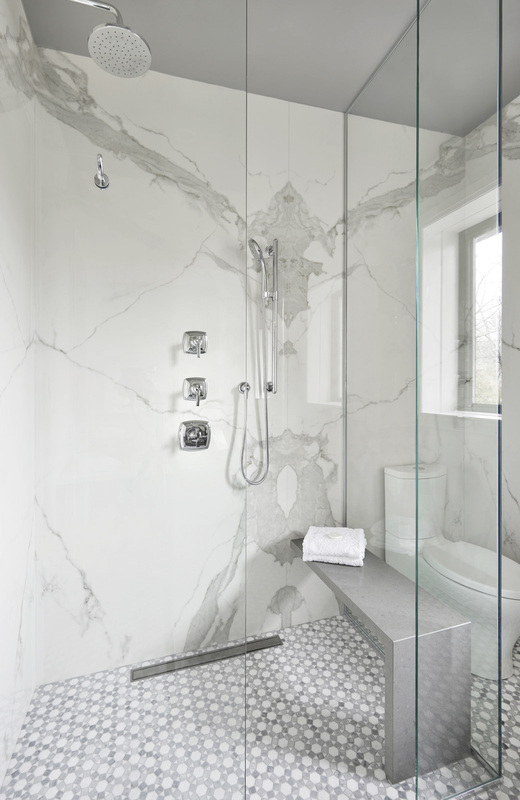 Balance is achieved in the ensuite bathroom with various grey tones displayed in fluid and geometric patterns. 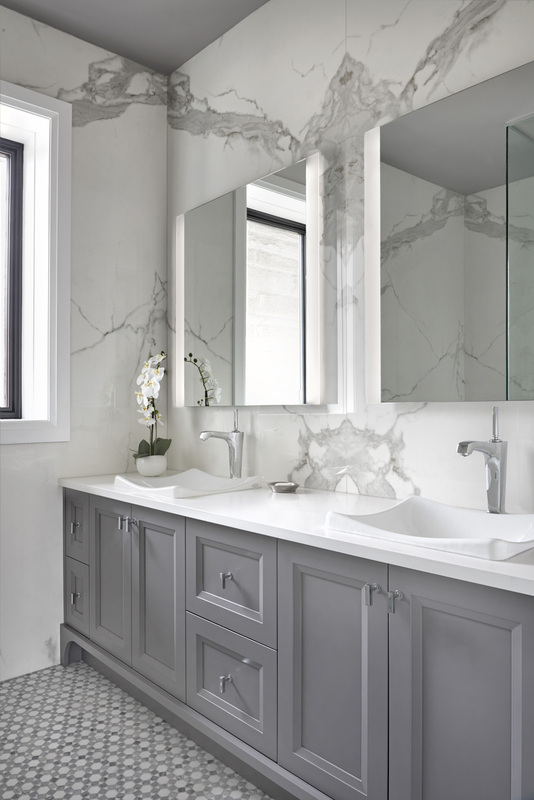 Aiming for balance in the main bathroom, the designer grounded the space by using grey cabinetry and mosaic floor tiles while keeping the walls neutral with a light marble-look porcelain tile. “We wanted the architectural elements to ‘float’, so the bench, for example, provides seating while taking minimal floor space,” she says. 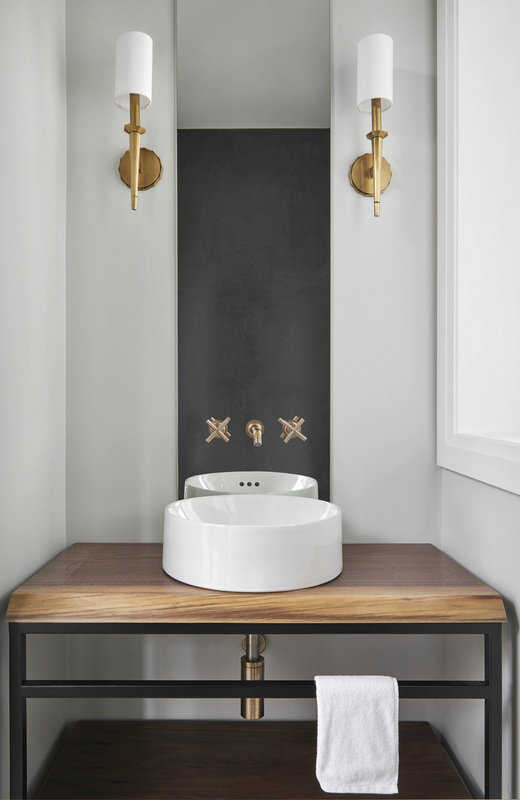 Gold-coloured fixtures add a luxe touch to the powder room. Throughout the house, a muted colour scheme creates a sense of serenity. Vanity: Anazaõ Inc.